Although the Hunts Point Cooperative Market in the South Bronx is one of the largest food distribution centers in the world, many of its neighbors are without access to quality, healthy food. The median annual income in the South Bronx is $19,113, and good groceries are sparse. The BLK ProjeK was born out of the frustrations of one such inhabitant: Tanya Fields. Tanya was a poor, single mother who moved to the South Bronx and found her asthmatic child struggling with the pollution generated by the hundreds of thousands of semis that deliver food to Hunts Point every year. The struggles of her son led Tanya to think increasingly more about environmental justice. She began drawing connections between the unhealthy urban environments in which poor people lived, and the unhealthy food available to them. She also, naturally, began drawing connections between the unhealthy food available to poor urban communities, and the women who serve that food to their families. Tanya realized that poverty has a feminine face. 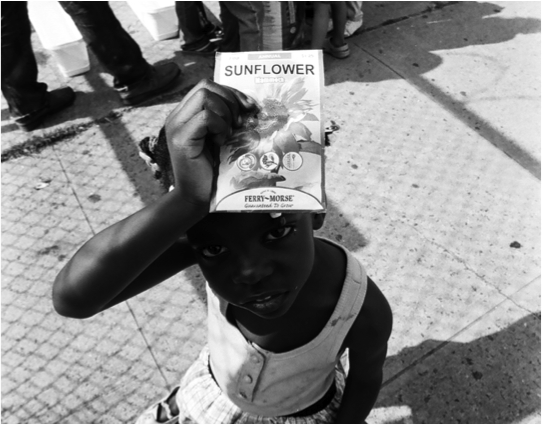 In order to tackle the insufficient access to healthy food in the South Bronx, Tanya consequently turned to mothers. She starting small, facilitating “Mommy & Me” classes in order to educate mothers about nutrition. In 2009, her efforts expanded beyond the classroom to the garden, and the BLK ProjeK was born. The women of BLK ProjeK were guerilla gardeners from the outset. They broke into abandoned lots in the South Bronx and planted vegetables. They created a groundswell, compelling more than 200 residents to petition and telephone the Housing Preservation and Development of NYC, demanding that the city allow the BLK ProjeK to turn one of those lots into an urban farm. Eventually their demands were heard, and that lot became the Libertad Urban Farm. In order to deliver produce from the Libertad Urban Farm to their community, the women of the BLK ProjeK then renovated an old school bus, turning it into a beautiful mobile market running exclusively on used vegetable oil. But Tanya and the BLK ProjeK have their sights set higher still. They want the South Bronx to be able to feed itself. They want to change the economic and political landscape of the community by creating local jobs and promoting municipal participation. And women remain the catalyst in all this. The BLK ProjeK is driven by its firm belief in the “girl effect” – the notion that investing in women and women-led efforts is the most effective way to promote social change. Women plant the seeds of physical and fiscal health in every community. If you would like to support Spark’s fundraising efforts for The BLK ProjeK, you can make a donation on Spark’s website. If you are interested in providing pro bono services for them, please email programs@sparksf.org. We are thrilled to support this wonderful organization. Visit BLK ProjeK’s website to learn more. This entry was posted in Economy, Grantees, Philanthropy and tagged activism, business, economic empowerment, Food Justice, girls, grantee, Grantmaking, SparkNYC, women's rights. Bookmark the permalink.